I’ve spent the day shifting manure for the vegetable patch and buying hedging plants, so it’s been a real outdoors day. But even better than that, I’ve been out on my first proper badger watching trip of the year. The evenings are now light enough to get a chance of seeing badgers before it gets too dark. By 7.50pm the sun had set and I was sitting in my favourite tree. To be honest, I’m a little rusty. I haven’t done this for a while. I moved to quickly in the wood. I was clumsy and noisy. I put up a small herd of fallow deer and a couple of muntjac on my way in. But hey, this is all part of the experience. It always takes a little while to get back into practice, to really tune in and learn to move at the slow pace of the wood, not the frantic city pace that I’ve grown accustomed to. At 8.10 I could hear the unmistakable sound of a badger gathering bedding on the other side of the sett. A few minutes later a badger trotted into view. You know, this will be the fifth year that I’ve been watching badgers, and I still get a thrill when I see a stripey face in the twilight. The badger snuffled this way and that as it foraged in the dried leaves. It was now too dark to see with the naked eye, but the badger was visible through binoculars. Binoculars are the poor man’s night vision. A good set of binoculars with a large objective lens will act as funnel, collecting and concentrating the available light. Another few minutes later, a pair of badgers emerged from a hole in the middle of the sett and sat for a while grooming contentedly. As the light faded completely a pair of muntjacs began barking incessantly and it was time for me to go. So far, so good. 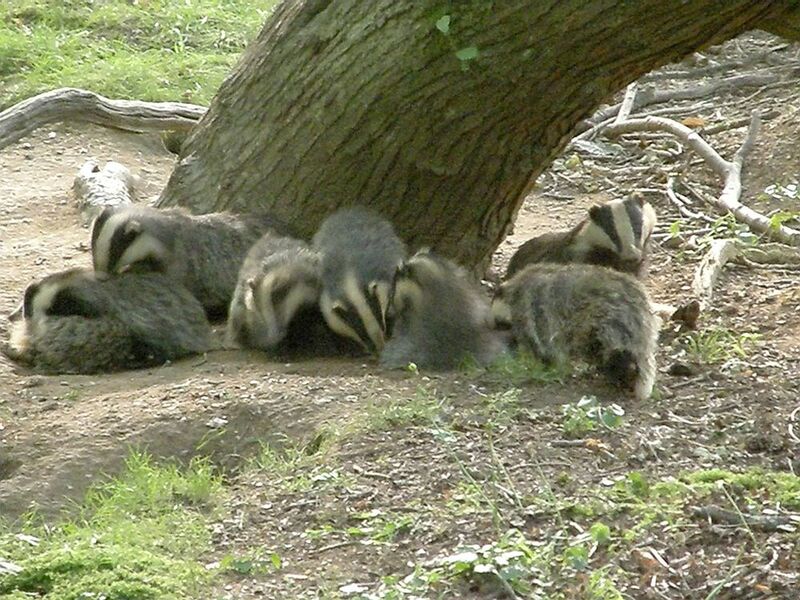 There are at least three badgers in the sett and they seem healthy and happy. I was a bit worried last year when they didn’t seem to be thriving, but there are plenty of signs of activity at the moment. Let’s hope they have a better year this year. I’ve finally found time to watch your videos – very interesting! It looks like a useful technique for finding out which holes are active, and as you say, if you can keep an eye on them, what times the badgers are coming out. Hi Lucy – thank you very much, that’s very kind. I’m looking forward to reading through Loose and Leafy. It looks very interesting indeed. You’re in a beautiful part of the country. I think you meant to leave a link to a particular badger picture? Not sure if you can grab it off the site, but if not I’ll scale it down and send it on to you.